Last week I headed to Las Vegas for a week of debauchery and excess. Little did I know I was going to have a science epiphany on the way there. I was squeezed into a little airplane seat on my way to Atlanta for the first leg of my trip and, as I often do, I struck up a conversation with the guy sitting next to me. It turned out that he was an engineer whose job it was to design the machinery that makes kettle chips. He's also an implementation engineer who goes out to the various sites where kettle chips are made and installs the new machines. He talked about how there are constant advances and upgrades and I said, with a smile, "Better chips through science!" He didn't laugh. He said, "Well, yeah. 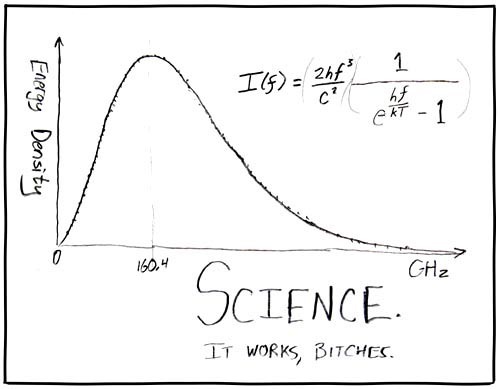 That's what science does. It helps us make better stuff." The utter obviousness of this truth really struck me. I was cruising at a cool 500ish miles an hour 35,000 feet above the ground, while joking about the impact of science on snack foods. Considering the humble beginnings of the aircraft about a century before, that's pretty amazing. At one point we had some rough air as we had to go around a thunderstorm. There were some truly beautiful lightning strikes as we flew next to this massive bank of storm clouds. I was sitting there awe-struck by the power of nature and by the very idea of man defying such potentially destructive forces - and my fellow passengers were grumbling about the seatbelt-fastened sign being on. That's the thing about science. It's all around us every day, worked into the design of every thing we use, woven into the fabric of our lives. All of these amazing things that we've got around us from aircraft to kettle chips came from science, and because we never have to think about it, most of us never do. It just works. On the next leg of my trip, I sat next to another engineer. This guy was an expert on steam power, and he worked for a company that goes around to power plants and evaluates them for safety and efficiency. I was still on a "wow, man, science" trip and I asked him 2983579 burning questions. As we headed down over Las Vegas, I looked down at the lights and asked, "Do you ever look at this and think, 'I helped make that?'" The fine young man looked at me like I was on drugs. He shrugged and said, "I guess so..." by which he clearly meant, "No, crackhead." Science is awesome. Engineers do cool stuff with it. Every once in awhile, it strikes me that the people who are creating our future are all around us and we don't even realize it. Hell, they don't even realize it. When I got off the plane, the first thing I did was buy a bag of kettle chips in honor of my seatmate. Science is delicious. Awesomely terrific post! My brother and father are both engineers, and both of them could (if they weren't so practical and down-to-earth) legitimately say, "something I did changed the world." I pointed it out to my brother once and he replied that he'd once tried to figure out the power and person hours wasted by the thing he helped develop but it was too depressing, so he'd stopped. (He worked on the technology behind youtube.) Still, it makes me look at people in a different way to know that anyone -- your next-door neighbor, the random stranger passing on the street, or the person sitting next to you on the plane -- might be changing the world. You never know, and isn't that just amazingly cool?